We Filipinos love to see a fight. On some drunken summer nights in the suburbs, it isn't surprising that groups of intoxicated tambays begin shouting and hurling rocks or bottles at each other. It isn't also surprising as the fights happen, people will go out of their houses to watch. We love the drama and we somehow love the danger. But the biggest reason probably is to know who will prevail and if we guessed the winner correctly. Such is the mentality of a Filipino in a derby. But what about a spider derby? I'm not sure how this started in the Philippines. Maybe one of our ancestors got bored making chickens fight and he noticed a lot of spiders in the house, got a stick and made 2 arachnids fight. Or maybe some foreign guy (as always) showed how it is being done. I just realized that the last sentence makes us look very stupid or very unoriginal, always some foreign guy introducing something to us. Oh well, that's life. Thus began the demand for spider breeds fit for fighting. Late in the 80's there were still guys going around elementary schools selling gagamba to students here in Metro Manila, but in the 60s and 70s, what you use in fighting is what you caught. Kids would go out on dusk, scanning leaves, flowers and trees for any spider setting up its dinner table. Dusk to nighttime is the best time to look when they come out of hiding to hunt for food. 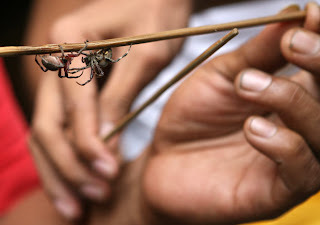 Once caught, a spider is kept in a matchbox and are ready for fighting. But its not just the children who are engaged here, this is popular among adults too. 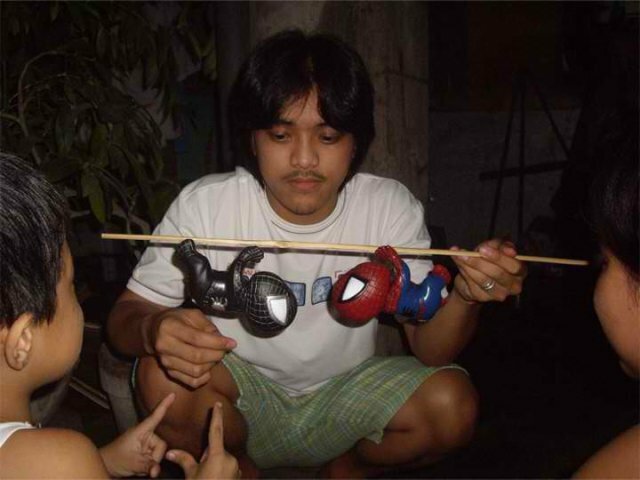 Since we Pinoys are fond of fighting bouts and matchups (and also betting), spider derby became popular. Round after round of spider fighting is moderated by a referee. Knocking off the opponent is a way to score point but the spider making his opponent his dinner is a unanimous decision. The bettors then collect their winnings. Though popular in the past, there are very few spider derbies are left. Watch this video, its about a gagamba derby.